Hamon Australia is an Engineering Firm in the heart of Crows Nest Sydney, who needed a refurbishment that reflected its new image. Hamon Australia provided Clockwork Projects with a clear brief: clean lines, fresh feel and a fixed cost contract. Together they worked through a number of challenges being limited space, tight turnaround time and minimal budget. From this Clockwork Projects created something different from Hamon’s previous layout and provided lots of storage space to contain the many paper plans and arch lever folders. The Clockwork Projects team quickly set out to draw up space planning floor plans to create a feeling of expansion in a tight space. Clockwork Projects colourist team introduced, sandy browns, splashes of block colours and timber veneer finishes adding warmth. The benefit of having a neutral base pallet being, added flexibility for future colour themes and finishes. For further cost efficiency, current workstations were recycled and upgraded to included adaptable colour panels to keep in line with future trends. Managing Director Albeer Leurquin says Hamon Australias big project challenge was the 10 day time constraint, and continuing business as usual with minimal disruption. “Time was of the Essence the Clockwork team worked from 6am until 10pm daily and managed to finish ahead of schedule”. Albeer quoted Clockwork Projects were knowledgeable and had excellent Project Management skills. When asked for a recommendation to other businesses looking to refit their offices, Albeer quoted “I would describe Clockwork Projects as the State of Art in office refurbishment”. Clockwork Projects delivered a modern office with lots of storage space and clean surfaces. The new reception area is inviting and professional. 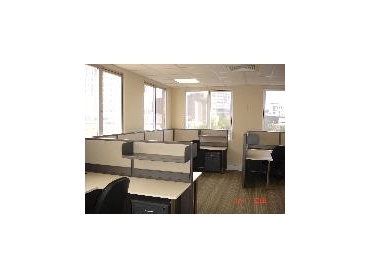 The working areas have all natural lighting and beautifully refurbished workstations.